I thought I was done with this theme, but my mom gave me a mostly-full bottle of locally made raspberry wine a few days ago. Hmm…raspberry plus rose equals what? Yes, that's a tiny toy Ispahan. Yes, I bought the entire Pierre Herme set. 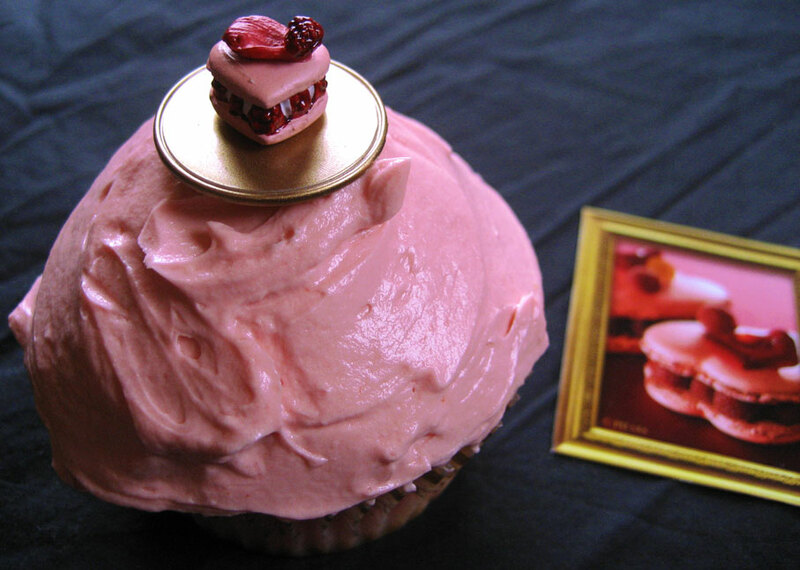 Give up?…It’s two of the three flavors that compromise Ispahan, the flavor combination invented by Pierre Herme. Since I’ve never had a chance to visit Paris or Tokyo, I’ve never had the opportunity to try one (or any macaron, for that matter). When do we get a New York patisserie already? This jar smelled like pure awesome. Once I decided I really wanted to try for an Ispahan-inspired cupcake, I realized I had to find myself some lychees. Unfortunately, the closest store that carried them was an hour away. That didn’t stop me and I returned home with two cans. If it were possible to find them fresh, I would have loved that, but canned is tasty, too. Before starting the mix up the cupcakes, I removed the lychees from their syrup and soaked them in a mixture of raspberry wine, rose-flavored syrup and enough lychee syrup to just cover the fruits…oh, and a few dried rose petals, too! Once the lid was screwed on tight I shook the jar a bit to combine everything and let it sit while I made the cupcakes and frosting. You can sort of tell, though the interesting thing I found about the lychees is that they already smell like a combination of berries and roses. Another thing that would have been nice to have fresh was raspberries, but they’re so expensive and sad-looking this far out of season that I couldn’t do it, and wasn’t about to settle for frozen, figuring they’d just get mushy. No, I didn't bother chopping up the lychee, since I didn't have raspberries. Z didn’t like these at all. I think he might have given them more of a chance if I had maybe cooked down the wine a bit. The whole thing definitely tastes alcoholic, but if you enjoy wine then you wouldn’t mind at all. I had a lot of cooking to do today and wanted to get these done and photographed before I lost what little natural light the snowy weather was allowing me, so I didn’t take the extra time to reduce the wine. It has a very bright, sweet raspberry flavor aside from the alcohol taste, and I decided it could stand on its own. My lack of time was also a factor in how the cupcakes are decorated. You can see I didn’t bother to mess with the pastry bag and went straight to the knife-spreading. I’d actually been a little nostalgic lately about the cupcakes I used to make for work…not the mix or storebought frosting part (I’m so very ashamed), but the simple frosting spread on with a butter knife and littered with colorful sprinkles. You can also see that, in keeping with the theme of a very pink, Valentine’s-friendly dessert, I kept my papers and decorations in that same vein. 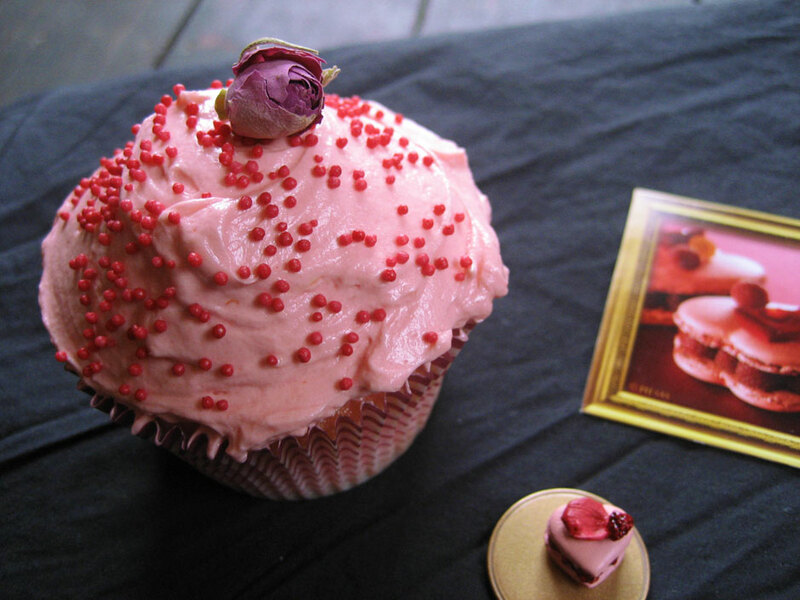 These cupcakes are very Valentine’s-friendly in general…Predominantly pink with the flavors of roses and wine. Sweet and intoxicating at the same time. I'd accept this Valentine any day! Remove the lychees to a jar. Reserve syrup. 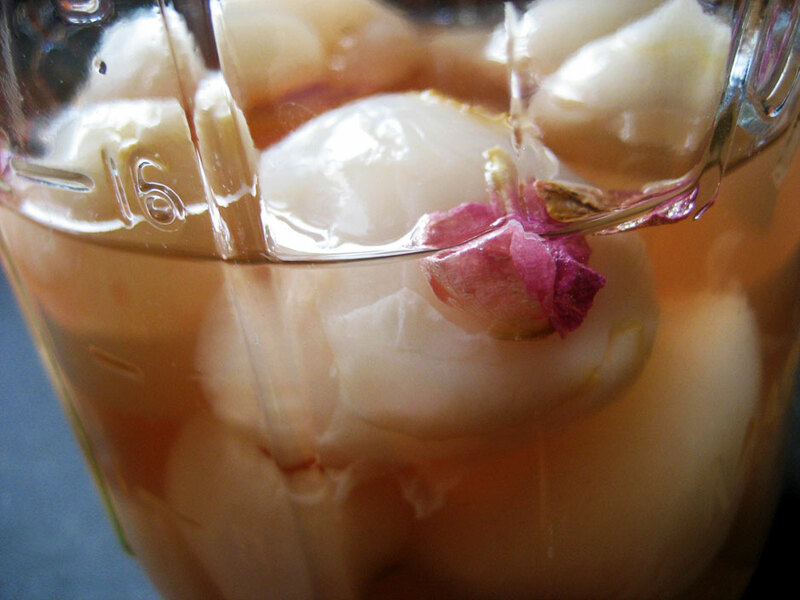 Add the wine, rose syrup and petals to the jar, then add enough lychee syrup to cover. Screw lid on tightly and shake gently, then allow to sit while you make the cupcakes and frosting, jostling the jar every once in awhile to keep everything evenly covered. In a stand mixer or with a hand mixer set on a low speed, cream the butter, then add the sugars. When the mixture is light and fluffy, add the flour, baking powder, salt and milk. Once everything is well-mixed, add the whites and turn up the mixer speed to high, beating until smooth and fluffy. Add the rose syrup and food coloring and mix until the batter is a uniform color. Bake in a preheated oven at 350 for 10-15 minutes (until a toothpick inserted comes out clean, but before the cakes start to brown on the top). Allow to cool fully before filling and frosting (the process may be sped up by putting slightly-cooled cupcakes in the freezer for a few minutes). In a stand mixer, whip the yolks until light and foamy (about five minutes). In the meantime, combine the sugar and water in a saucepan over medium-high heat. When the sugar mixture reaches a temperature of 238, pour into a Pyrex liquid measure. With the mixer off, drizzle the sugar syrup into the yolks a bit at a time, mixing intermittently. Once all the sugar has been added, continue to whip on high until the mixture reaches room temperature. Switch to the paddle attachment and turn the mixer to medium-high. Add the butter one Tbsp at a time, waiting for each piece to be fully incorporated before adding the next. Continue beating until light and fluffy, then add the wine and food coloring and beat until fully combined. Cut a large cone out of each cupcake and fill with a lychee, open side up. Trim the cupcake top to fit inside the lychee and replace. Frost with raspberry buttercream and decorate with red, pink and white sprinkles, rosebuds and/or fresh raspberries if you have them. There are a few specific ingredients/techniques that I think are important to these cupcakes. I used vanilla sugar instead of extract or beans so the color of the cupcakes would not be affected. The decision to use cake flour instead of AP was a little last-minute, but I’m glad I did it – the cakes have a very light, moist, fine crumb and are just slightly rose-scented. And even though I decided I wanted to go more in the meringue direction when it comes to my frostings, I just had to use a French buttercream for this particular recipe. Speaking of which, if I’d had more time I’d also have made more of a filling for them. I think once raspberries actually are in season, I’ll try to reinterpret this idea. Of course, by then I hope to be pretty decent at making macarons myself, so I won’t have to substitute with cupcakes! omg! this sounds and looks so lovely! lychees in raspberry wine sounds insanely good! These would be fun to make when I have a big group of gal pals over. They’re just so girly looking. I’m sure Sara Jessica Parker would approve. EEEE! you have the mini Ispahan! It’s so cute! 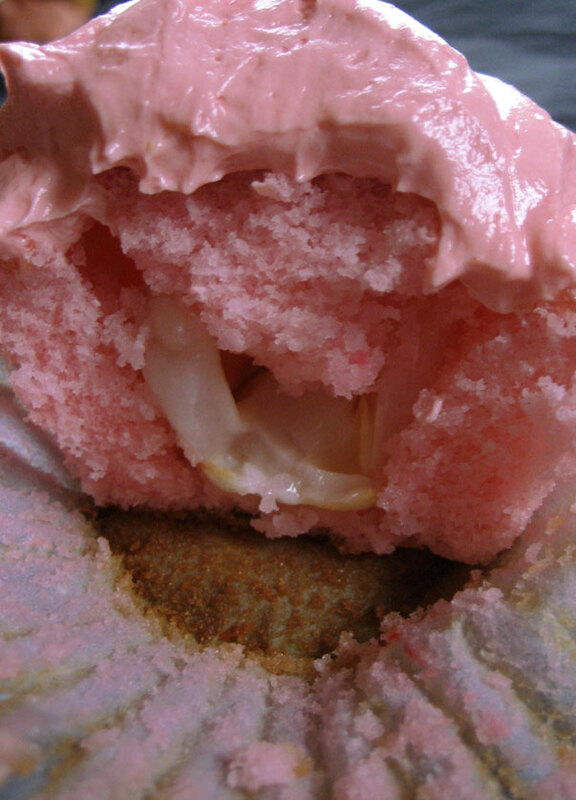 love the colours in your cupcake…and that’s a mighty nice chunk of lychee in there!